iDraw is a powerful feature-packed vector drawing and illustration application for Mac OS X.
iDraw has all of the tools you need to create everything from detailed technical illustrations to beautiful works of art. Create intricate designs quickly and easily, and continue working on the go with iDraw for the iPad. – Import SVG, PDF, EPS, and Photoshop PSD files. – Export designs as SVG, PDF, PNG, PSD, JPEG, GIF, and TIFF files. – Copy selected objects as PNG, PDF, SVG, CSS properties, and Core Graphics code. 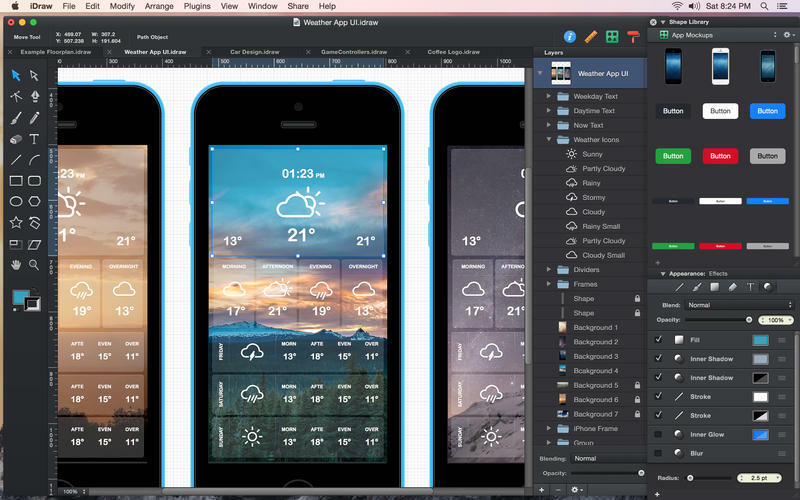 – Export icons, bitmap and vector images directly into Xcode xcasset folders. – Export layers and tagged objects automatically as individual files. – Import layered PSD files with vector paths and effects. – Shape layers are imported as editable vector paths. – Layer effects are imported as fully editable drop shadows, inner shadows, glows, etc. – Export designs as layered PSD files. – Full-featured Bezier Pen tool for creating custom shapes. – Brush and Pencil tools for fluid drawing and sketching. – Essential set of shape creation tools. – Path multi-point selection and editing. – Join, connect, and disconnect paths. – Rotate, Scale, and Shear transform tools. – Apply multiple strokes, fills, and effects to any object. – Apply inner shadows, drop shadows, and glow effects to objects. – Arrange the order of fills, strokes, and effects using drag and drop. – 24 vibrant blend modes, including Multiply, Overlay, Linear Burn, Vivid Light, etc. – Set blend modes for layers, shapes, fills, strokes, shadows, and glow effects. – Snap to Grid / Snap to Point. – Align and Distribute objects. – Linear, Radial, and Angle gradients. – Convert Text to Paths. – Inner and Outer Strokes. – RGB, HSB, and Hex Color Pickers. – Import PDF files and annotations. – Export as vector-based PDF and SVG files. – Plugins / Powerful scripting API. – Fast rendering of very complex projects. – Multi-threaded drawing ensures lag-free scrolling and zooming. – Fixes related to @2x and @3x image export. – Fix for Eyedropper tool when setting gradient colors. – Improvements to the new in-place settings panes. – Other minor fixes and improvements. 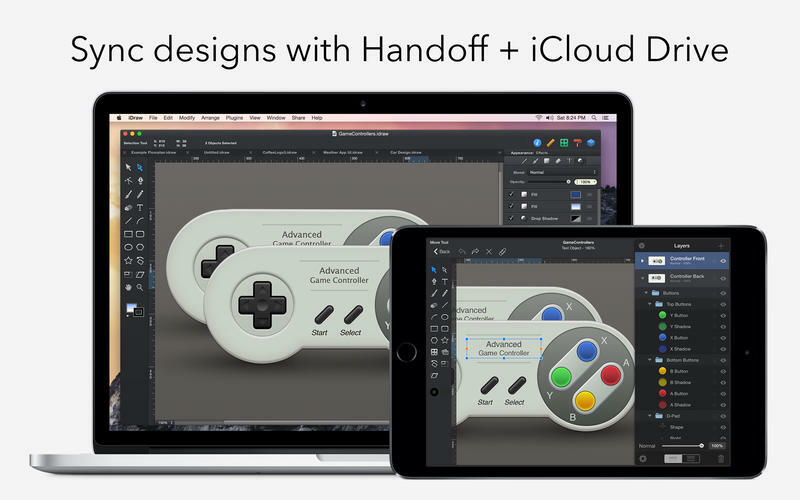 – Use Handoff to seamlessly continue editing a document on a different Mac or iPad. – Store and access iDraw documents directly on iCloud Drive. – Support for Handoff and iCloud Drive requires Yosemite and iOS 8. – Beautiful new interface designed for Yosemite. – New single-window interface with in-place settings panes. – Switch between Single Window Mode and Floating Panels (View > Show Floating Inspectors). – Create print-ready documents with CMYK colors. – Assign CMYK color profiles (Modify > Color Settings…). – Choose between RGB and CMYK document color modes. – Export CMYK-based PDF documents. – Fill shapes with repeating vector patterns. – Create new patterns from any selection of shapes. – Use the ‘+’ button in the pattern fill popup to create a new pattern. – Rotate and scale patterns using the settings in the Fill pane. – Clip objects inside vector shapes. – Paste objects inside of a shape to create a clipping group (Edit > Paste Inside). – Release clipping group shapes using the ungroup command (Arrange > Ungroup). – Double-Click an object inside of a clipping group to select it directly. – Apply a blur effect to any styled object. – Enable, disable, and adjust blurs from the Appearance Effects pane. – Adjust the blur radius to control the amount of blur applied. – Quickly select objects which share the same appearance settings (Edit > Select Similar…). – Easily find and select objects based on their stroke color, fill color, opacity, etc. – Find and select objects across all layers, or only within the currently selected layers. – Automatic @3x asset generation. – Export bitmap and vector assets directly into Xcode xcasset folders (File > Export Layers…). – Shadow and glow effects are now exported using SVG filters. – Improved Swift code export for Swift 1.0 language changes. © Copyright 2015 Indeeo, Inc.